In other words, Maciunas’s extreme dislike of smoking was at once very personal—his seriously poor health made him sensitive to smoke (a fact he may have sometimes exaggerated to make a point)—and a political one—in the face of all the collective Fluxus work to be done, smoking seemed to him frivolous, self-indulgent and decadent. It was this combination of the personal and political that compelled Maciunas to develop fellow Fluxus artist George Brecht’s idea for a “no smoking” sign (c. 1963) into an innovative visual graphic, which both traded on and countered corporate advertising of the day. Maciunas was a highly skilled typographer and graphic designer. He did commercial work to seek out a living, but used non-commercial venues to experiment with new ways of representing ideas in graphic form. His multi-disciplinary studies in architecture, art and graphic design at Cooper Union, in architecture and musicology at the Carnegie Institute of Technology, and in art history at NYU’s Institute of Fine Arts, exposed him to an array of visual information—from musical scores to architectural blueprints—giving him the tools to develop his unique graphic style. We see this early on in his ambitious information charts, begun in the late 1950s, which trace developments in the histories of art and world events, covering antiquity to the present. Well-versed in the history of the avant-garde from Dada to Lettrism, Macuinas continued these groups’ interests in the visuality of text, often as a means to explore the conceptually challenging spaces in which semiotics break down. Fluxus, in particular, but also journals such as Film Culture, were where his most inventive designs came to light. His numerous posters for Fluxus events, the set of name cards he created for each Fluxus artist, the Fluxus collective anthologies, and, perhaps most of all, the little plastic Flux-boxes with their eye-catching labels, together convey Fluxus’s distinct graphic identity. And given Maciunas’s emphasis on selling Fluxus objects—as low-cost amusements for everyone—his control over Fluxus’s graphic image can be seen as an early example of strategic use of branded identity in the arts. Before the term “corporate identity” entered common business parlance, Maciunas was using collective visual identification to push Fluxus ideas through the system parallel yet counter-ideologically to major companies. One corporation’s use of signs to persuade the public to purchase its products proved particularly compelling at that time. Phillip Morris’s creation of the “Marlboro Man” in 1954 became arguably the most effective and iconic advertising campaigns of the era. With the figure of the Marlboro Man—so evocative of the myth of rugged American masculinity and individualism associated with the frontier—the company was able to tap into consumer desires for simple “manly” autonomy in an increasingly complex world, turning sales around for the cigarette previously marketed “effeminately” as filtered and mild. The company’s use of the cowboy image was powerful enough to survive the first blows of incriminating studies connecting smoking cigarettes with cancer and the banning of televised cigarette ads in 1971. It wasn’t until numerous “Marlboro Men” featured in the advertisements began dying prematurely of lung cancer that the campaign itself was killed. As a society we are now much more aware of the grave health risks of cigarettes to smokers themselves but also to those inhaling second-hand smoke. Despite the disappearance of the Marlboro Man in most countries, tobacco ads continue to be ubiquitous, using clever brand management to attract new (and increasingly younger) customers. A 1996 ruling by the FDA revealed how tobacco companies were using cartoon characters as brand logos and pushing sales policies that targeted minors and sought to prevent such strategies. While Maciunas rarely set foot in bars—fume-filled spaces that they were in the 1960s—he also imposed a strict ban on smoking in his own living quarters. It was one of the first things a visitor noticed. As Ken Friedman recalled of his initial encounter with Maciunas at his SoHo apartment in 1966: “I walked up the stairs to find a black door covered with violent, emphatic NO! SMOKING!!! signs.” There was also a sign placed prominently in Maciunas’s bathroom—in case a guest thought he or she could get away with a few puffs behind closed doors. George Brecht came up with the idea for a straight-forwardly presented “no smoking” sign in the early 1960s, but around 1971 Maciunas brought his designers eye to the project, creating a small card that was included in Fluxpack 3, edited by Maciunas. 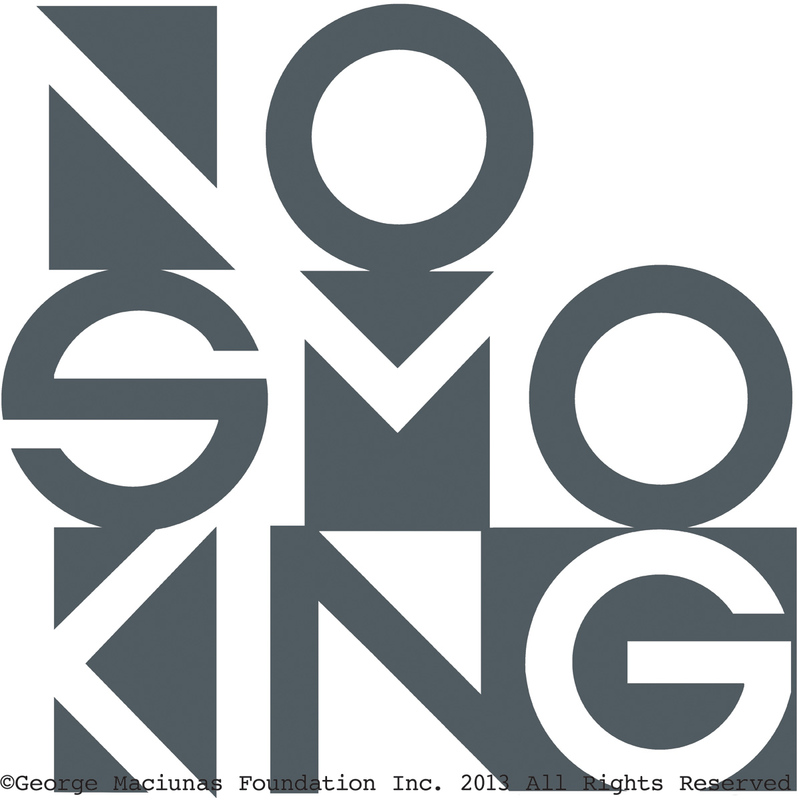 The card’s text reads “No Smoking” in Maciunas’s characteristic interlocking typography that alternated between white text on black and the opposite. Maciunas plays with line, geometry, layout to impress upon viewers the liminality between text and image, between form and content. Interested parties could obtain the design in small sign, poster or wallpaper format. Contrary to glossy, seamless corporate advertising aimed at manipulating desires to turn a profit, Maciunas’s unconventional aesthetic actually calls attention to the way image and text are constructed to convey a thought-provoking social message.